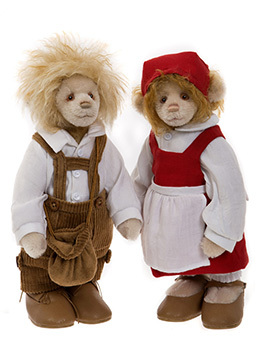 Charlie Bears Hansel and Gretel Discounts Apply ! Hansel is made from Light cream short pile mohair and he has blonde hair, and a hand stitched nose and mouth. He is a wearing brown cord lederhosen, with attached braces, a white shirt, brown shoes and a brown bag across his shoulder.